Growing Microgreens and Wheatgrass can be some of the most rewarding small-scale gardening because your crop is done so quickly—and frankly, because it tastes so good! 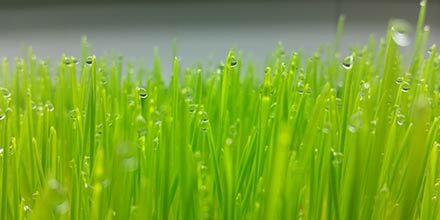 However, since growing Wheatgrass and Microgreens require a substantial amount of moisture, mold growth becomes a common occurrence. This causes many folks to become frustrated and even quit, unknown to them the simple steps that one can take to treat and prevent mold, and it may sound easier than you might think: control the moisture, control the mold. Mold spores are everywhere! Even though we can’t see them, they are constantly wafting through the air—even as you read this. There is no way to “get rid” of mold spores. But no worries! Mold spores themselves are not inherently bad unless they find the ideal conditions to grow. Not all mold spores are the same either. Some grow on wood, food, carpet, and other various places. It is when the spores land on a damp surface to their liking and are exposed to continual humidity that they grow into the familiar spider web-like growth. 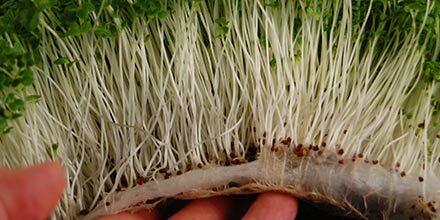 It is also not uncommon to mistake the micro hairs attached to the roots as mold, but they are actually signs of healthy growth. But understanding this and the role moisture plays in getting mold spores started will give you all the knowledge on how to keep mold spores dry and in the air and out of your counter-top garden! First, take into account what climate you live in. Is it dry? Or is it humid? Sometimes you may need to adjust your care slightly based on where you live and whether you are using soil methods or hydroponic methods of growing. For example, higher humidity areas will absolutely require ventilation or a substantial amount of airflow, whereas in dry climates you may get away with less airflow. Or in dry climates, watering may be required more frequently rather than in humid areas. Basically, the trick is to judge what your tray needs based on what the soil or hydroponic growth pad looks and feels like. Your soil or hydroponic pad should be moist, not soggy! Gently, press your finger into it. Whether it is a pad or soil, the goal is to provide just what the plants need. Not too little or too much, but just right. When checking your soil or pad, it should be spongy—not muddy. You should be able to feel the moisture within the hydroponic pad or soil. It should not be secreting out. Water should not collect on the surface of your tray; it is the ideal environment for mold spores to land and spread. To avoid surface saturation, try bottom watering. After your seeds have taken root, pour water into the bottom of the tray, so the root hairs will soak it up. This will provide essential moisture to your tray without saturating the top. Keeping your air moving and ventilated is of the utmost importance because (a) it keeps the mold spores moving, giving them less of a chance to settle and (b) it help keeps the air from becoming stagnate and causing the air in and around the tray to have increased humidity. Open a window nearby during the day, and or keep a fan going on low in your growing space. Without proper airflow, your flat may appear dewy or give off a pungent scent. If you find that your trays have already started growing mold, don’t panic. Just try all of the above tips to control the humidity and airflow of your growing space and mix either a few drops of hydrogen peroxide or grapefruit extract into a spray bottle and mist your flat. Soil may be a better option for high-humidity areas because it acts as a great regulator. Hydroponic pads tend to need more care as they don’t hold water as well as soil. So, try both and see which medium suits you and your growing style best! Can you water all the time with the GSE, or is it a one time thing? 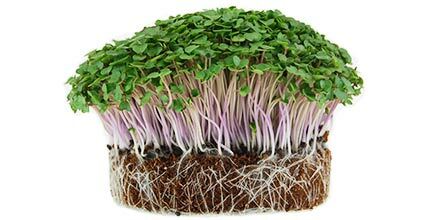 I live at Belleview Washington, and we have enough humidity here, and I have hard time growing broccoli sprout and wheat microgreen. I grape seed extract and hydroperoxide. and constant fan, but nothing working. How much hyrooxide ( 3%) do you recommend a quart of water sprayer ? How much grape seed extract is safe for broccoli sprout ? I used hyfrogen peroxide and I noticed broccoli sprout are weathering.